7:1.1 Everything taught concerning the immanence of God, his omnipresence, omnipotence, and omniscience, is equally true of the Son in the spiritual domains. The pure and universal spirit gravity of all creation, this exclusively spiritual circuit, leads directly back to the person of the Second Source and Center on Paradise. He presides over the control and operation of that ever-present and unerring spiritual grasp of all true spirit values. Thus does the Eternal Son exercise absolute spiritual sovereignty. He literally holds all spirit realities and all spiritualized values, as it were, in the hollow of his hand. 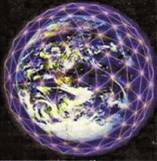 The control of universal spiritual gravity is universal spiritual sovereignty. 7:1.2 This gravity control of spiritual things operates independently of time and space; therefore is spirit energy undiminished in transmission. Spirit gravity never suffers time delays, nor does it undergo space diminution. It does not decrease in accordance with the square of the distance of its transmission; the circuits of pure spirit power are not retarded by the mass of the material creation. And this transcendence of time and space by pure spirit energies is inherent in the absoluteness of the Son; it is not due to the interposition of the antigravity forces of the Third Source and Center. 7:1.3 Spirit realities respond to the drawing power of the center of spiritual gravity in accordance with their qualitative value, their actual degree of spirit nature. Spirit substance (quality) is just as responsive to spirit gravity as the organized energy of physical matter (quantity) is responsive to physical gravity. Spiritual values and spirit forces are real. From the viewpoint of personality, spirit is the soul of creation; matter is the shadowy physical body. 7:1.4 The reactions and fluctuations of spirit gravity are ever true to the content of spiritual values, the qualitative spiritual status of an individual or a world. This drawing power is instantly responsive to the inter- and intraspirit values of any universe situation or planetary condition. Every time a spiritual reality actualizes in the universes, this change necessitates the immediate and instantaneous readjustment of spirit gravity. Such a new spirit is actually a part of the Second Source and Center; and just as certainly as mortal man becomes a spiritized being, he will attain the spiritual Son, the center and source of spirit gravity. 7:1.5 The Son's spiritual drawing power is inherent to a lesser degree in many Paradise orders of sonship. For there do exist within the absolute spirit-gravity circuit those local systems of spiritual attraction that function in the lesser units of creation. Such subabsolute focalizations of spirit gravity are a part of the divinity of the Creator personalities of time and space and are correlated with the emerging experiential overcontrol of the Supreme Being. 7:1.6 Spirit-gravity pull and response thereto operate not only on the universe as a whole but also even between individuals and groups of individuals. There is a spiritual cohesiveness among the spiritual and spiritized personalities of any world, race, nation, or believing group of individuals. There is a direct attractiveness of a spirit nature between spiritually minded persons of like tastes and longings. The term kindred spirits is not wholly a figure of speech. 7:1.7 Like the material gravity of Paradise, the spiritual gravity of the Eternal Son is absolute. Sin and rebellion may interfere with the operation of local universe circuits, but nothing can suspend the spirit gravity of the Eternal Son. The Lucifer rebellion produced many changes in your system of inhabited worlds and on Urantia, but we do not observe that the resultant spiritual quarantine of your planet in the least affected the presence and function of either the omnipresent spirit of the Eternal Son or the associated spirit-gravity circuit. 7:1.8 All reactions of the spirit-gravity circuit of the grand universe are predictable. We recognize all actions and reactions of the omnipresent spirit of the Eternal Son and find them to be dependable. In accordance with well-known laws, we can and do measure spiritual gravity just as man attempts to compute the workings of finite physical gravity. There is an unvarying response of the Son's spirit to all spirit things, beings, and persons, and this response is always in accordance with the degree of actuality (the qualitative degree of reality) of all such spiritual values. 7:1.9 But alongside this very dependable and predictable function of the spiritual presence of the Eternal Son, there are encountered phenomena which are not so predictable in their reactions. Such phenomena probably indicate the co-ordinate action of the Deity Absolute in the realms of emerging spiritual potentials. We know that the spirit presence of the Eternal Son is the influence of a majestic and infinite personality, but we hardly regard the reactions associated with the conjectured performances of the Deity Absolute as personal. 7:1.10 Viewed from the personality standpoint and by persons, the Eternal Son and the Deity Absolute appear to be related in the following way: The Eternal Son dominates the realm of actual spiritual values, whereas the Deity Absolute seems to pervade the vast domain of potential spirit values. All actual value of spirit nature finds lodgment in the gravity grasp of the Eternal Son but, if potential, then apparently in the presence of the Deity Absolute. 7:1.11 Spirit seems to emerge from the potentials of the Deity Absolute; evolving spirit finds correlation in the experiential and incomplete grasps of the Supreme and the Ultimate; spirit eventually finds final destiny in the absolute grasp of the spiritual gravity of the Eternal Son. This appears to be the cycle of experiential spirit, but existential spirit is inherent in the infinity of the Second Source and Center.